Starring Roy Scheider, Robert Shaw, Richard Dreyfuss. I had seen parts of Jaws over the years, but had never sat down to watch the entire movie. I am kind of amazed that it has taken me so long to do so, as this is a top-of-the-line summer blockbuster flick. 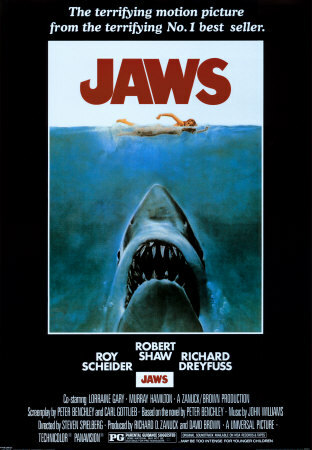 It’s impressive that a movie of this caliber can wait until the hour-past mark to actually show the great white shark. In fact, I found the first half of the movie to be the most fascinating, as we are watching an unseen creature terrorize a small island town. This is when the horror elements kick into full gear; we know a huge shark is out there, but since we don’t see it we feel somewhat invincible to a potential attack. But then, of course, the shark kills a couple people, including a child, and all hell breaks loose. Starring Rufus Sewell, Kiefer Sutherland, Jennifer Connelly. I added Dark City to my project because I have some friends that absolutely love it, and because it was listed as Roger Ebert’s best movie from 1998. While watching the film, I was intrigued by its neo-noir style. It has obvious similarities to The Matrix, which was released one year later, and I can see why it has a bit of a cult following now. The dark atmosphere, dystopian city and intriguing sci-fi plot were all things I enjoyed from the movie. Unfortunately, the acting hampered things a bit for me. Jaws is a fabulous film. One of my favourites. It will live long as an important piece of cinema history – not only is it a great thriller, that is expertly realised, it ushered in the age of the blockbuster and Hollywood has never looked back. I agree that its influence is undeniable. Definitely an entertaining film, and easily the best “shark movie” I have seen. Thanks for stopping by, Dan! This is a post right up The Lawlor family street. Jaws is one of my all time favourite film. Amazing story, with amazing direction, A master piece. Haha, good stuff! Glad to hear you guys are such big fans of these movies. I was hoping for a little more from Dark City, but I can see why it has such a cult following these days. Man I haven’t seen Jaws for ages, but that is one great classic from Spielberg. Not many films made such an impact like that one, for a while lots of people were afraid to swim in the ocean because of it. Still the greatest shark movie of all time IMO. 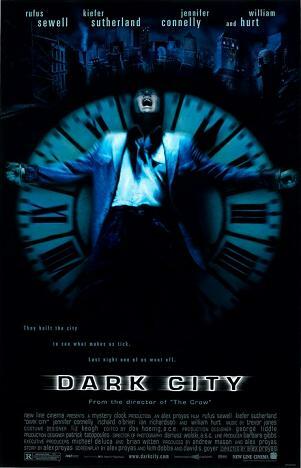 I really like Dark City, it’s so underrated but more people should check it out. I think the lead character’s aloofness is perhaps a requirement for that role? In that regard I think Rufus was compelling. Yeah, I can’t think of a better shark movie than Jaws. Dark City was enjoyable, but Sewell’s performance really bugged me for some reason. I loved that neo-noir feel, though. These are both good films to scratch off your list. I can live with Dark City getting a 7, its not the most accessible film.